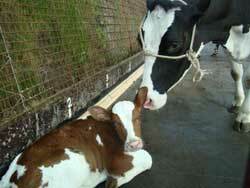 Europe sees many changes in dairy farming. Technological developments and high consumer demands with regard to the way of producing food are forcing the changes. Important spearheads include animal welfare and the environment. The High Welfare Floor anticipates the developments with an innovative floor concept. All that is needed for the High Welfare Floor is a flat and stable surface. This will create opportunities for free stalls and cow lounges. The use of innovative materials has reduced the capital expenditure per square metre by up to 20% below the level of traditional barn floors. Savings can also be made on the overall building costs by cutting the costs for the cellar construction and the flexible structure. The High Welfare Floor aims to distinguish itself from the current barn floors within the entire dairy sector on the following issues: animal welfare, ecology / the environment, flexibility, labour, cost price and sustainability. An entirely new way of building and use of materials will reduce the emission of ammonia to an absolute minimum. ABOVE PRODUCT IS STILL IN TESTING AND IS CURRENTLY UNAVAILABLE FOR SALE AT THE MOMENT. IF YOU WOULD LIKE MORE INFORMATION PLEASE CONTACT US.